Movies dealing in any way with the Holocaust, be it the execution of it or its everlasting effects, tend to be difficult because any story pales in comparison to the most horrific act of cruelty in human history. Extraordinary real-life stories are still found and frequently told, and Operation Finale, which deals with the pursuit and capture of escaped Nazi war criminal Adolf Eichmann, the architect of the Final Solution and Mr. "banality of evil" himself, should have been one of them. The plot to bring him to justice is remarkable and an important emotional addendum to the atrocities committed by Eichmann and others, but the tone established by director Chris Weitz is unsure, and the philosophical power struggle between captive and captors uninspiring. It's unclear the kind of movie Weitz is going for here. Operation Finale presents itself as a cold, clinical spy movie about Peter Malkin (Oscar Isaac) and the Mossad agents who undertook the secret mission to capture Eichmann (Ben Kingsley), who was hiding away in Nazi-friendly Argentina. But Wetiz and screenwriter Matthew Orton couch it in weird comedic diversions that feel out of place, and certainly when they come from the mouth of Malkin who is simultaneously vengeful, troubled, and grief-stricken over the death of his sister at the hands of monsters like Eichmann. The film works best in the planning stages, like so many heist movies do. And this is very much like a heist movie, except that it's a person who needs to be stolen, not some rare jewel. It all starts when a young Jewish girl (Haley Lu Richardson, go watch her in Columbus or Support the Girls instead) meets and falls for a young man named Klaus (Joe Alwyn). Now, you'd think his name would be a dead giveaway but he is a Nazi, and it just so happens his father is Adolf Eichmann, who is going by the name Ricardo Klement and working as a foreman in plain sight. When the Mossad learn of this, they launch a plan to capture Eichmann and bring him back to Israel to stand trial for his part in the genocide of 6 million Jews. Malkin is not in favor of this plan. He wants Eichmann dead, and that's the only justice he believes a man like him deserves. Plus, getting in and extracting Eichmann from Argentina, which is full of Nazi sympathizers reaching to the highest levels of government, will be far from easy. Better to just shoot him dead and be done with it. Others in Malkin's team agree, with nearly all of them having lost loved ones during the Holocaust .There's a powerful but woefully brief scene where the team talks about the family who died because of Eichmann an the Nazis. It's followed shortly thereafter by a visit from the Israeli Prime Minister, who tells them that their people's entire history is counting on them to succeed. No pressure. Operation Finale needed more scenes like that, to get across the enormity of what Eichmann did. Perhaps fearful of being too grim, the film never goes too deep into Eichmann's part in the slaughter; nor does it really dig into his mindset or that of Malkin, who are posed as obvious rivals. There's a great deal of tension in the execution of the plan, as things go briefly haywire as most well-laid plans usually do. And then it becomes a waiting game as the team is forced to hold Eichmann in a safe house for days, leaving the war criminal time to play a game of emotional chess with Malkin. Their conversations aren't particularly enlightening, though. Eichmann takes the "I was just a numbers guy following orders" stance that many Nazis took to defend their actions, but the script doesn't attribute much else to him other than a distinctly mannered attitude. Malkin proves to be a lightweight in these discussions, as well, and even begins to sympathize with Eichmann, which understandably pisses off others stuck in the safehouse with them. This is the second movie in a few months that has found Kingsley playing an escaped war criminal, the other being An Ordinary Man. In both he takes on an air of superiority that is both magnetic and terrifying. He makes for a good foil with Isaac, whose Malkin is haunted by visions of his dead sister. The slow revealing of his backstory and closeness to his sibling is the most powerful aspect of a messy and anti-climactic final act. Others in the cast don't get much to do, and that includes talented co-stars Melanie Laurent as Hanna, the team doctor who shares a past with Malkin; and Nick Kroll as mission leader Rafi Etan. 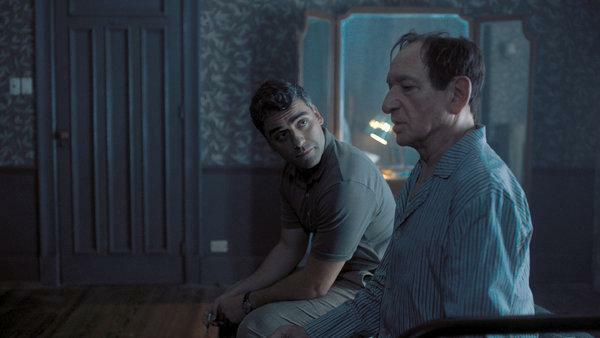 Operation Finale is well-executed but lacks the insight to be more than just a pretty good movie about the Holocaust and there are already enough of those.